Nexrutine Extra is a proprietary extract of the Chinese tree Phellodendron amurense. It has been used for at least 1500 years in Traditional Chinese Medicine as the bark, called Huang-Po. Each capsule contains 500 mg. Other ingredients include snow white filler, microcrystalline cellulose, magnesium stearate, silicon dioxide, gelatin, glycerin, purified water. 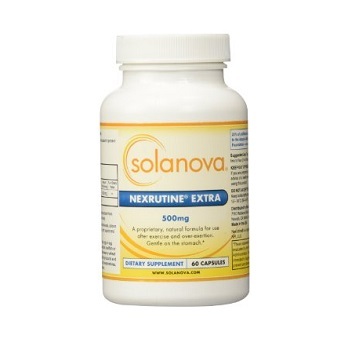 Nexrutine is a patent pending natural pain management formula, gentle on the stomach. Nexrutine is a selective Cyclo-oxygenase 2 (Cox-2) inhibitor like Celebrex™ or Vioxx™. It blocks 95% of Cox-2 production. Cox-2 is a critical part of the inflammatory process. This is a special price and further discounts do not apply. No side-effects have been noted at normal dosages. Do not use Nexrutine while pregnant or lactating. Nexrutine is not intended for children. If you are taking any prescription medication, this product may not be appropriate for you and you should consult your physician before taking it. Although Nexrutine is a natural plant extract that has been shown to be gentle on the stomach, it can be classified as a selective COX-2 inhibitor. This class of compounds should not be taken if you have impaired renal (kidney) function, impaired heart function (heart disease), or hypertension (high blood pressure). This class of compounds may increase edema (accumulation of fluid or swelling), blood pressure, or bleeding time in some persons; if such symptoms occur, discontinue use. Do not take Nexrutine with aspirin or any other product that prolongs bleeding time. Take one capsule 2 to 3 times daily with or without food. Supports kidney and bladder health. Promotes sensible eating and food intake - naturally. Improves energy, physical endurance, and sensual performance.